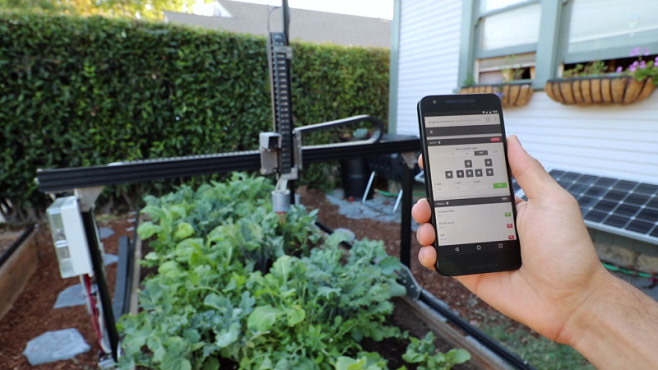 This Farmbot Thing is Getting Real! Our Farmbot team has been hard at work preparing for the arrival of Farmbot. We’ve been saying it’s due to arrive in February, but that may be a little optimistic. Actually, Farmbot will begin shipping packages in February in the order they were purchased; we’re not sure how fast they will get down to our order. No matter when Farmbot arrives, there’s much we need to do to prepare the way. Here’s a report we presented at the CAMGA holiday party on Tuesday. Your “Farmbot Team” is a loosely organized group eager for additional participants. With apologies to others who have participated but are not named, our group consists of the following persons: John Barnes, Johann Beumer, Amanda Borden, Lee Borden, Lynda Edwards, Linda Griebel, Candy Jones, Mallory Kelley, Mary McCroan, Katrina Mitchell, Carol Pugh, Bill Quailes, and Laurie Weldon. There’s lots of information available on Farmbot at https://farmbot.io/. We are due for delivery as early as February. We have much to do before Farmbot arrives! We will create an outdoor focus area between the existing office building and Queen Ann Road (where the three magnolias are now). It was painful, but we reluctantly decided that two of the three magnolias need to be removed so Farmbot and the control bed we plan to build will be in full sun. The county will pull up the trees by the roots and supply us some decent quality soil to fill in the holes that are left to create a flat area. We will build a six-foot privacy fence that will delineate the focus area, which will also provide space for a quail run, a seating area, and an outdoor classroom. It will be served from inside the office building by the west door of the building and from outside by two gates: (1) a pedestrian gate accessible from the southeast corner of the outdoor area, and (2) a vehicle gate that opens onto Queen Ann Road. The bed to accommodate Farmbot will run east and west near the southern edge of the outdoor area, but set back far enough from the privacy fence so the fence doesn’t shade it during key daylight hours. Because the robotics of Farmbot are precise, the bed to accommodate them must be precise as well. So the bed will be heavier and more thoroughly braced than a typical raised bed. We will use treated yellow pine 2 x 12 boards, braced every 5 feet with posts anchored in earth and concrete. We will actually build one long bed 1 ½ meters by six meters, about 5 feet by 20 feet. The end closest to the building will be the Farmbot end, and the end closest to Queen Ann Road will be the control bed. In the future, we will have the ability if we wish to do so to extend Farmbot to the entire bed at modest additional cost. We will have one or more webcams pointed at the bed so it can be monitored from off site. We will organize a handful of workdays to build the bed and then the fence. This is exciting work; we will need lots of hands! This document is a work in progress. We will revise it as we develop plans.